Are You Ready to Find Clarity and Focus? All it takes to upgrade your life is deciding it’s time to step up to the plate, commit to change, and stay the course. Think about your future. Are you living the life you were designed to live? Regardless of the amount of success you’ve achieved in life or the happiness you feel you have, there is always room for growth. Having a growth mindset is critical to success. People who possess growth mindsets are more content, experience greater achievement, and live lives of deeper significance. The opposite is true of those who have fixed mindsets. People with fixed mindsets are held back from making positive changes in their lives and experience less achievement and joy. Transformation does not happen automatically. Living a balanced life, one that flows with greater ease, is dependent upon your ability to live intentionally and take ownership of your decisions. Your unique path to living a more significant life is paved by self-awareness and requires action on your part. Do you know how to push past your limitations and create balance in your life? 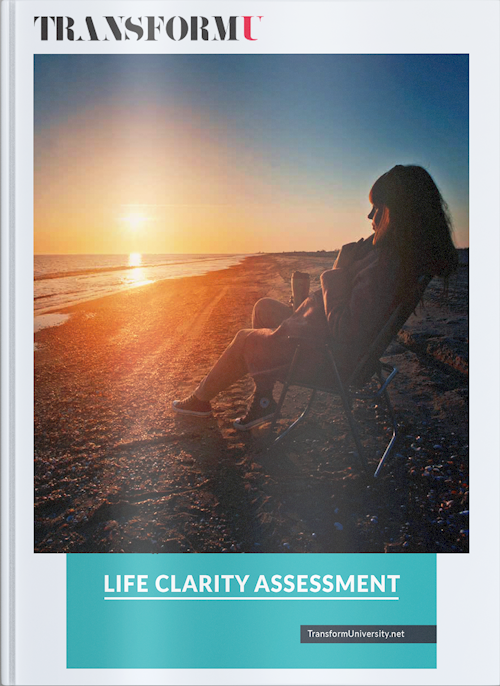 The Life Clarity Assessment is designed to help you do just that; create awareness. Self-awareness is the first step towards change and the key to the door that unlocks transformation. Look closely at each segment in the Wheel of Life and assess the quality of your life in every component. Gaining an accurate view of where you are today will help you make the necessary adjustments to get to where you want to be. Too many people settle in life. As children, we dream about what we want to be when we grow up. As adults, we shift that focus and work hard at what we want to do. We get so busy doing that we’ve forgotten who we want to be; consequently, many never fully become who they were intended to be. If you aspire to have a blockbuster life, set a firm intention and with pen in hand write yourself into the hero’s role of your story.